Hello, and Welcome to The Digital Wine blog. 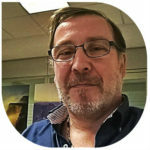 My name is Rolando Mucciarelli, aka Wine Roland, I’m an Italian wine blogger, since ten years I write about wine since 2011 in my blog Storie del Vino: I’m a Sommelier. I’m ever been interested to wine, its stories and its people, I’d like to talk about wine hearing the tales that winegrower loves to tell me. But my main job is technology, I work on it since 25 years, before as sysadmin and now as architect of monitoring systems on financial and management platform. So, the digital wine am I: I’m Wine and I’m Digital. Many times I’ve had the problem to explain how-and-what of these systems to very good people in finance or logistic or delivery but not in informatics, and translate for them what a supplier was telling. Two years ago I read some interesting articles about sensors used in vineyards, so I built my Italian blog Web in Vigna and this blog. Well, I’d like help winegrowers and spirit’s business that need use digital technology in their daily work. For these people, many times is difficult to understand what a technician says, and for an engineer is even more difficult to understand the job to make the wine. I’m the man in the middle, the Demand Manager, a bridge to connect Wine and Spirits with Digital Tech. The posts you’re going to read here have this scope, to explain what other winegrowers and spirit dealers do with technology, what is the state of the art of Wine Tech and how spirit business use Social Media, and raise the curiosity around this topic.